The use of lawn signs and personalized Hershey’s candy bars has been rapidly growing as a fun and unique way to announce special occasions! Just think how great it feels to see a sign that you ordered on a loved one’s lawn knowing you are a part of their most joyous times. 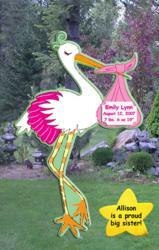 On Long Island, NY the concept of yard signs is becoming more popular as a way of celebrating new babies, graduations and birthdays. Along with the overall excitement special occasions create among families, yard signs make important lifetime events feel even more special. Some of the factors contributing to the growing demand for lawn signs on Long Island, NY and in other states are that they can be used all year round and in all kinds of weather including rain and snow. Photos that families take next to their lawn signs and a keepsake plaque that Signs of Love creates for the family are great reminders of the joyous occasion. They help create long lasting memories. Family members, including siblings, grandparents and extended family, as well as friends, have been ordering lawn signs and personalized candy bars to surprise each other from other states as well, gifting them to their loved ones as a special gesture of love when they live farther away or cannot travel. In addition, Grandparents have been incorporating lawn signs into their celebration of their new grandchildren by ordering signs for their lawns. The use of personalized candy wrappers is also a growing favorite of many since it’s a way of personalizing a special event. Personalized candy bars are used as favors or as a decoration on a table. They can be personalized for any use and are often used to celebrate anniversaries, birthdays, retirements, christenings, communions, graduations, baby showers, picnics, tea parties, family reunions, and Sweet Sixteens, to name a few. About: Signs of Love’s (signs-of-love.com) signs range from 4 foot tall baby carriages and 7 foot tall lawn storks to 4 foot birthday and graduation signs. There is also a large variety of custom candy bar wrappers for all occasions. Sibling stars/bears and ‘It’s a boy’ and ‘It’s a girl’ star displays are available as well. Signs of Love proudly announces new babies and special occasions throughout Nassau County, NY and has been incorporating Suffolk County and Queens as well.